Several perennial grass species, such as energycane are being assessed for their biomass energy potential. 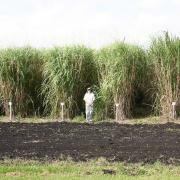 Energy cane research on muck soils in Florida. Photo: Extension Farm Energy. Numerous subtropical and tropical perennial grasses are being evaluated for use as a biomass energy feedstock. Among them, Energycane (Saccharum spp. ), giant reedgrass (Arundo donax), elephantgrass/Napier grass (Pennisetum spp. ), and erianthus (Erianthus spp.) are adapted to various areas of the southern United States. They are all characterized by high yields — 30 to 100 tons/acre (green); prolific growth habits; tolerant of variable soil fertility and moisture conditions; and less pest problems. While similar in many characteristics to temperate annual and perennial grasses, their growth and chemical composition vary enough to warrant a brief review as potential bioenergy feedstocks. A series of University of Florida/IFAS Extension publications, highlighted below, offer specific details to an introduction of these species that follows. Energycane is a term without scientific definition but is often used to refer to sugarcanes (Saccharum spp. or crosses thereof) that are high in fiber and low in sugar. Like sugarcanes, they are tall-growing (10 feet plus) perennial C4 grasses grown in the relatively frost-free areas of the southernmost states (Florida, Louisiana, Texas, and Hawaii) where there is plentiful rainfall or irrigation. They are envisioned to be planted similar to sugarcane by stem cuttings (seed cane) in 5- to 6-foot row widths and harvested about every 12 months by “green cane” harvesters. Elephantgrass, also called Napier grass, generally refers to Pennisetum purpureum or similar species. Its culture is much like that of energycane in planting and harvesting. Cold-tolerant varieties can be grown as far north as southern Alabama, Georgia, and Mississippi. It is taller (up to 15 plus feet) than energycane, with finer, harder stems, and more rhizomatous. The prolific nature of this species has resulted in its being designated as an invasive species in some areas of the United States. Erianthus (Erianthus arundinaceum) looks similar to sugarcane and is often used in sugarcane breeding programs to improve cold tolerance. It is a tall-growing (similar to sugarcane) C-4 perennial grass that grows and is managed similar to energycane. Because of its cold tolerance, it can be grown a little further north in the southern United States than energycane or elephantgrass. Giant reed grass (Arundo donax), unlike the other species, is a C3 perennial grass that grows taller (12 to 18 feet plus) than the other species noted above and is adapted as far north as Maryland. It has a hollow stem and has some characteristics in common with bamboo and phragmites. It has been propagated by stem cuttings, rhizomes, and tissue culture plantlets. Because of its prolific growth habit, even though not a viable seed producer, it has been designated an invasive species in some states. Unlike the other three species, it is usually planted on 3-foot centers and, because of its prolific growth, fills in the space by the second season. It can attain 5 to 6 feet in growth in a single month under warm, moist conditions and be ready to harvest every 8 to 9 months. Its best performance comes from wetter areas, although it will tolerate dryland conditions. While many of these species have been evaluated in numerous trials over the past 30 years and produced promising results, no major commercialization for biomass energy has occurred to date. Without large-scale production, crop adaptation, pest susceptibility, and other management aspects of production and utilization cannot be assessed. Energy from Crops: Production and Management of Biomass/Energy Crops on Phosphatic Clay in Central Florida. Research and Extension information about growing biomass crops, comparative performance and potential for converting to energy.